Unlawful blockades by fuel protesters should not be tolerated, the government is warning, as hauliers and farmers prepare to protest over rising prices. A Road Haulage Association convoy of about 30 vehicles is expected to create a rolling blockade on major roads in Scotland from 1000 GMT on Saturday. Demonstrations are also planned at refineries across the country by a group calling itself Transaction 2007. The government says it is monitoring the situation, along with police. 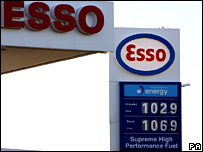 The day of action comes after fuel prices on garage forecourts rose above the £1 per litre mark in recent weeks. Demonstrations are planned at refineries at Stanlow (Ellesmere Port, Cheshire), Fawley (Southampton), Jarrow (Tyne and Wear), Purfleet (Essex), Cardiff, Immingham (North East Lincolnshire), and Grangemouth (Falkirk). These are also due to start at 1000 GMT. Transaction 2007, which says it represents hauliers, farmers and motorists, is calling for rebates on the price of fuel for hauliers, farmers and essential road-users and a reduction in the level of tax on fuel. It also wants extra duties to be imposed on non-UK lorries that come into the country on business. The organisation's website urges those taking part in its protests to act within the law. A statement from the Department for Business, Enterprise and Regulatory Reform said the situation was being monitored by the government, police and the road transport industry and that contingency plans were in place to cover "a range of eventualities". It said: "Everyone has a right to peaceful protest but unlawful blockades should not be tolerated." It said police had a range of powers to deal with public disorder, blockades, picketing, harassment and road traffic, which they would use if necessary. It added: "Any disruption to fuel supply would cause a great deal of inconvenience to people. Planning to mitigate the effect of possible future fuel supply disruptions, through our contingency plans, is a prudent course of action for any responsible government." Saturday's convoy protest in Scotland is being organised by the Scottish branch of the Road Haulage Association (RHA). The RHA representing hauliers in the rest of the UK stresses that it is not connected to the Transaction 2007 refinery protests. A spokeswoman said: "As far as this action by Transaction 2007 is concerned, it's nothing to do with us. There are some RHA members who I'm sure will be taking part and that's their prerogative. "We fully sympathise with why they are doing it but we just don't feel it's quite the right way to go about it." Lorry drivers are calling for the government to introduce a fuel price regulator, which would freeze fuel duty while the price of oil remains volatile. They are also unhappy about a 2p increase in fuel duty introduced in October. Philip Flanders, of the Road Haulage Association in Scotland, said the convoy would set out from Hamilton Services at 1000 GMT, moving eastwards towards Stirling along the M74, the M8, then M9. The trucks will pass the Ineos plant at Grangemouth before joining the A80 and heading south. Mr Flanders said the demonstration was being staged to highlight the problems faced by the haulage industry as a result of diesel costs and high fuel tax. He said: "Many hauliers are facing a bleak future and the public face higher prices for their shopping. "This affects everyone and we continue to urge the UK government to introduce a fuel price regulator and to freeze fuel duty while the price of oil is so volatile." Fuel prices have risen well over £1 per litre, with petrol prices at one west London garage reaching £1.28, giving Britain the highest diesel prices in Europe and the fourth highest petrol prices, according to the AA. But, unlike in 2000 when major fuel protests brought much of Britain to a standstill, the price rises have been caused largely by rising oil prices rather than an increase in taxation. Duty rises over the last decade add up to 25% - less than the rate of inflation. But oil prices have gone up 270% in the same period. The Campaign for Better Transport claims the cost of motoring overall has fallen in real terms over the last decade, while the cost of public transport has risen.